Draft notices that were sent to students in their first year of Hesder yeshiva will be cancelled, IDF officials say. 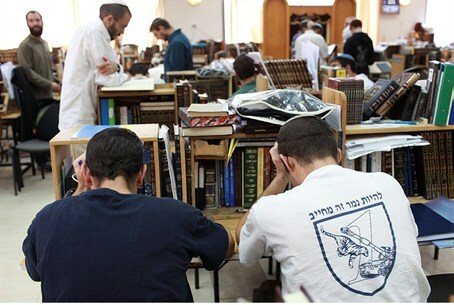 Draft notices that were sent to students in their first year of Hesder yeshiva will be cancelled, officials in the IDF’s Manpower Department told Arutz Sheva on Sunday evening. Earlier in the day, Arutz Sheva learned and reported that hundreds of students, who are not yet registered within the framework of the Hesder system, have received notices that they will be drafted into the army next month. The five-year Hesder program mixes Torah study with IDF service. Recruits in the program spend their first year and a half in the framework studying in yeshiva, then serve in the regular army for a year and a half, alternating with semesters of study in their yeshiva. While most of the Hesder students sign up for the program in advance of their studies, a sizable minority does not get around to it, attending to it during their first period of study and retroactively including that period in their service package. It is those students who are at risk of immediate draft due to an IDF bureaucratic snafu. Administrators in many Hesder yeshivot expressed concern to Arutz Sheva Sunday, saying that the change had not been coordinated with them. As a result, administrators have descended on IDF recruitment centers to sign students up for the Hesder program officially before they are issued draft notices – at which point it would be impossible to retroactively include them in the program.